actually that could be useful. I bought a new wheelbarrow because my old one is still going but getting dodgy and one load too heavy may well see it out, so i'm ready for that day. It occurred to me that in a shtf situation a wheelbarrow would be useful. If you had to carry water or firewood from a distance it would mean you could cart more and further. If someone was hurt,eg sprained an ankle you could carry them. With a bit of thought there's loads it would be useful for, which got me thinking of everyday objects that we take for granted but could be used for other things. Any suggestions? They're also useful for you're trying to move sheets of plywood and the like on a roofrack. I have an old-lady-type shopping trolley and it's **really** strong. I've carted 90 litre bags of bark chippings about on it. I don't know quite why it's over-engineered to that extent, but I'm glad it is. We bought a wheelbarrow as a wedding present for two of our dearest friends.They reckon its the most useful present they got! My property could not function without one,for sure. Mine is used for compost,soil,coal and mixing small batches of mortar/ concrete. Another very useful item is the plastic builders bucket.You cannot have enough of them! Is it because granny's were way ahead of us in carrying around a supply of tinned food? It occurred to me that in a shtf situation a wheelbarrow would be useful. If you had to carry water or firewood from a distance it would mean you could cart more and further. If someone was hurt,eg sprained an ankle you could carry them. Really must get round to making one of those too. Agree with the plastic buckets jansman. I used to work in restoration and lime putty was used a lot and came in large , up to around knee high , lidded plastic buckets. When we moved house I had over a hundred of them and loaded all sorts into them and that meant they could just stand outside clearing up space inside the house. As. To everyday objects we take for granted , tools and rope . I have made tools myself in the past and had a dabble with rope so I know the principal at least. But iff I had to make rope it would be a time consuming process , time that could be better spent doing something else. I've got a similiar one, my little red wagon, it's very useful too. Agree about the buckets, after carting water for months I'm very grateful to them. The kind with lids are great, I have several square ones which I use for storing sugar,pasta,rice etc. they stack and keep the damp out. Definitely picking up the ball and running with it but a pond. 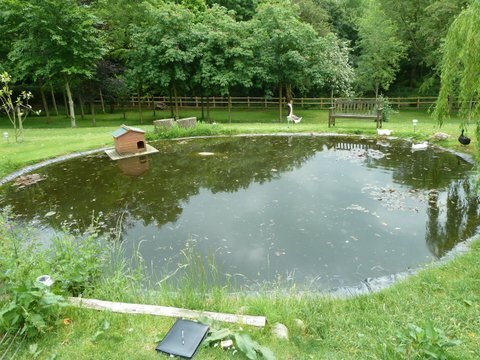 Even our wee garden pond has about a 1000L in it, and fish.... not a great deal of eating on them but a couple of them could maybe fill a tin of tuna. On a slightly grander scale though, a foot deeper, a couple foot wider, that's a lot more water... and the fish would be a bit bigger. Edit to add, that's not my garden pond, just a generic pond, my garden ain't that big.